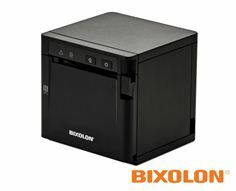 Düsseldorf, Germany – BIXOLON, a leading global mobile, label and POS printer manufacturer, today announced the launch of the SRP-Q300 3-inch (80mm) Direct Thermal ultra-compact, receipt and ticket printer to the European market. Redefining POS printing, the SRP-Q300 with its small footprint pushes the boundaries of conventional POS printing with its multiple configuration options for front-exit printing. This ergonomic printer with tidy cable management, non-slip rubber feet and reinforced lid combines aesthetics with functionality. Printing at speeds up to 220mm/sec with a printer resolution of 180dpi to provide high quality texts, graphics, barcodes and QR codes. Supporting USB and LAN connectivity as standard with optional Bluetooth and WLAN models plus NFC for Android™ functionality, the SRP-Q300 can be tailored to any POS application. The SRP-Q300 NFC Bluetooth functionality is ideal for initial printer setup and configuration with Android smart devices running on Android OS V3.1 or higher. Enabling user convenience throughout the printer setup, the BIXOLON Android Q300 Utility Software application on the Google Store provides exclusive setup compatibility with the SRP-Q300. For more information, contact us at http://www.bixolon.com, or follow us on these social channels: Twitter, Facebook and YouTube.